We’re ready to give you quality leads that will help your insurance business grow. Free 1-on-1 consultations. Our best-in-class account managers will provide recommendations based on the performance of agents in your area. Exact target client matching. We help identify the exact clients you’re looking for—down to their zip codes & risk profiles—so you can bind more business. Budget based on your business goals. 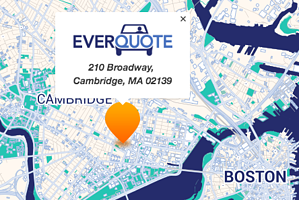 With EverQuote, you remain in control of your budget with adjustable lead caps and hours of operation. Want to learn more about us? Check out our agent reviews to find out how we’re helping our partner agents boost their bottom lines. By clicking "Talk to Sales" I consent by electronic signature to being contacted by EverQuote, including by automatic telephone dialing and/or an artificial or prerecorded voice (including SMS and MMS - charges may apply), regarding EverQuote for Agents, even if my phone number is listed on a Do Not Call Registry. I also understand that my agreement to be contacted is not a condition of purchasing any goods or services, and that I may call (844) 707-8800 to speak with someone about EverQuote for Agents.